If you have reason to go through the older part of the city center, i.e. Santo Cristo, Saúde and Gamboa, or just along the Av. Rodrigues Alves, by the docks, you will be surprised at the amount of “obras” there – not only road-works, of which there are plenty, but also new buildings and the restoration of old ones. There is plenty of information on the internet, under “Cidade Olímpica”, and “Porto Maravilha”, but try this one as it covers a lot of ground. The English cemetery at Gamboa sits right in the middle of this area, with the Morro da Providência behind and to one side, and the Cidade do Samba in front, where the waters of the bay once lapped the walls of the cemetery. On one side is the Instituto Central do Povo, a Methodist educational organization supported by the American Society. 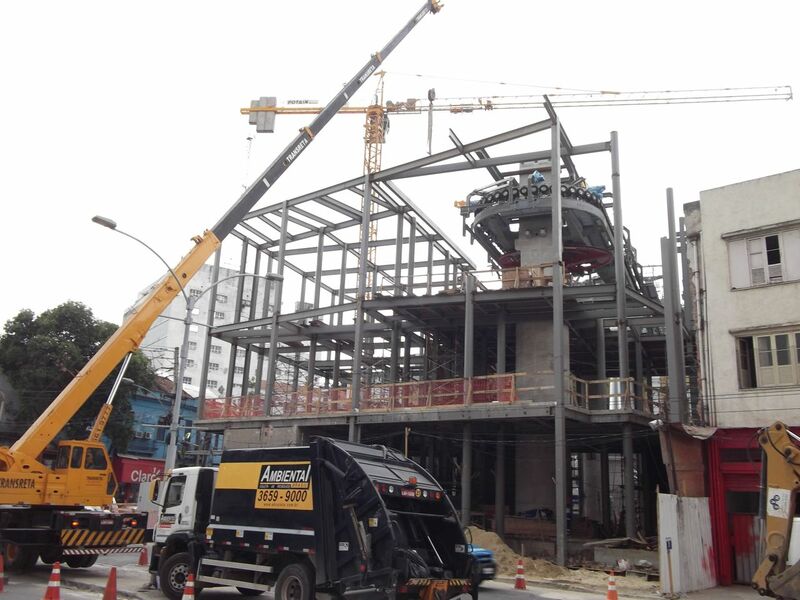 The Prefeitura is driving one of its major projects—the Morro da Providência teleférico—right through the middle of the Institute. This is a cable car system with one station on the corner of the Rua da Gamboa, one up top in the middle of the favela, and one next to the Central railway station on Av. Presidente Vargas (see photo). All this activity has made the Prefeitura look at the properties in the area with an eagle eye. They are taking over buildings, demolishing houses, and generally causing havoc, especially to the poorer people who live up the Morro da Providência (see the article “The View from Providência” by Theresa Williamson on page 17 of the October Umbrella). On the other hand, property is being snapped up by many before the real estate values skyrocket, although this is already beginning to happen. 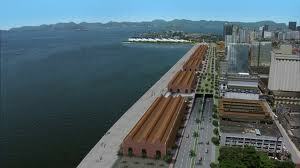 Meanwhile the whole port area is buzzing with activity, and plans are being laid for truly marvelous buildings, such as the highest residential skyscraper in Rio, with 40 floors, part of a group of buildings containing 1,330 apartments. No surprise that municipal employees will be given preference in the purchase of the apartments. The Providencia Teleferico, or cable car, is now being tested, and official inauguration is planned for April. In the photo, the carrousel round which the cars travel to make the return journey can be seen. The Porto Maravilha project intends to restructure this historical district of Rio de Janeiro and one of its key gateways. The project covers an area of five million square meters and will ensure the region’s complete restoration (economic, social, and environmental), including the districts of Saúde, Gamboa, Santo Cristo, a part of Caju, São Cristóvão, and the Downtown area. Plans up to 2015 include the demolition of the Perimetral overpass between Praça Mauá and Avenida Francisco Bicalho – building of 4km of tunnels and overpasses; redevelopment of 70km of streets; 700km of water, sewage, telephone, drainage, and gas networks; 650km of sidewalks; 17km of bike paths; 15,000 trees and other services. Facilities for the arts, sport, culture, entertainment, education, and housing will also be created. Areas of preservation and cultural and architectural heritage (such as the cemetery), and those buildings occupied by public services, are not included in the rebuilding plans. The Port area will also connect to other public transit hubs through a new light rail system (VLT), estimated to carry 200,000 people per day in its initial years. The area is meant to host mixed-use buildings as well as high-density mixed-income housing centered on several anchor projects, including two museums and some Olympic sites.